When visiting Istria, the most common encounter with the name “Žigante” is in the form of truffles. This is one of the brothers, Gian-Carlo, who has invested himself heavily in truffle production. Then, there are the other brothers, Duvilio and Denis, who have invested themselves in to the wine making craft and as we found out they’re making some very good examples of wines from the region. The truffle thing is a relatively new product for the Žigantes, seeing as how their family has been making wine for about 300 years. In 1997, the business came to fruition and they started producing a greater volume of wine up on the top of hill near the village of Kostanija. They produce from 14 hectares that are solely owned by the family and also from a few other growers around the immediate area. Even still, they produce just 50,000 bottles a year, seemingly leaning towards growing a lower yield from the vines. 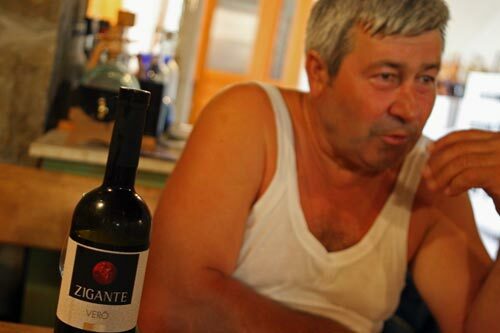 Duvilio is quite a character that opens up a good deal as he tastes more wines with you and we found that he’ll chat great lengths about his wines, as he started us with the 2006 Malvazija, which they like to age in half oak, half acacia barrels. It has a very subtle, light nose. The body is dryer than others we’ve tasted, but still holding a bit of citric fruits to it. The finish rolls down your mouth quite well. It’s smooth, but you can still taste the body in the end. We then moved to the 2004 Vero, which is also a Malvazija, but one that is aged for a year or more in the barrel. The nose is rather oaky despite the blend of woods in the barrel. Some soft breads come out of the wine as more air gets in to it. The body is wonderfully deep. There is a strong structure to it, but yet it is still smooth and plush. The finish is dry, but at the same time very smooth. Apparently, when the truffles are presented for tasting, it is very common to pair this wine with them as the flavors don’t trample each other. Duvilio also told us that the wine goes really well with the local cheeses that have a generally strong character to them. From there, we drifted in to the reds and 2005 Teran (Refošk), the native varietal to the area. The nose of this wine is very spicy, somewhat akin to a California coastal Syrah, although obviously different. The body is very full, dry, and pulls in to a clean finish that leaves just a touch of the dry tones on the palate. There is also a good deal of earthiness to the back taste of the finish. With air, the spiciness gives way to sweetness. The wine pairs well with anything that has a bit of fat or oil (olive, please) in it. It cuts through all the fluff to get at the true flavors of what your eating. Something of a machete for the taste buds if you will. We closed with the 2004 Teran. This has a great deal more earth to it then the 2005. There are also syrupy elements in the nose that just aren’t present in the 2005. The body has gotten more balanced and smooth with the extra age. Overall it’s a very well crafted wine that appears to be aging very well. So, whether it’s truffles or wine, the Žigantes have got you covered, although as we found that they needn’t be had at the same time. Both products are very strong and can stand on their own equally well.